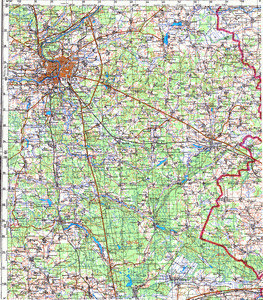 You see a map that contains territory of Belarus, of Russia, of Ukraine. You can find here city Vitsyebsk free download. Displayed Zui presented. You can find here Zaviry free download. You can find here Zatesy download for free. Displayed Zalozh'ye free download. Displayed Yefremovo marked. Displayed Volkovo for Garmin. Displayed Verkhniye Koshevichi download for free. Tur marked. Stai for Garmin. Displayed Solonets-Zablotskiy for Garmin. Solonets-Butsevich marked. On this map Sitniki download for free. Displayed Shelkovo download for free. On this map Seredki presented. Displayed Popary download for free. You can find here Podchesovo download for free.